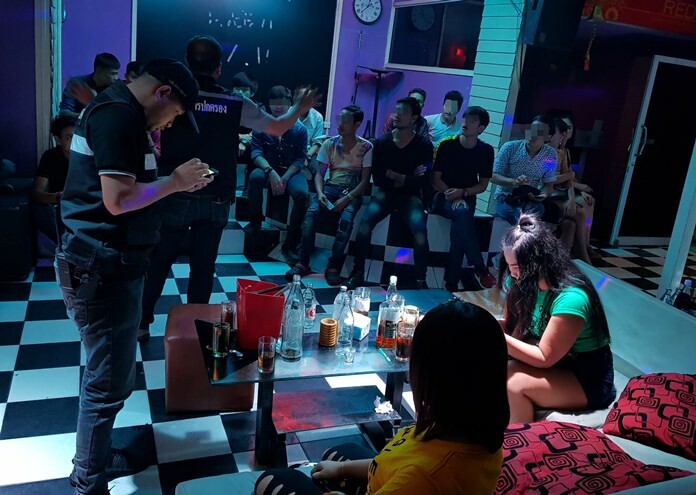 Banglamung District officials raided two Pattaya karaoke clubs that were blasting loud music after legal hours. District security chief Pichet Thammaro led police to the Oscar’s and Small Room karaoke joints Aug. 27. Seven people in all were arrested. Oscar’s, on Soi Chaiyaphum, had about 40 customers and employees on site when authorities burst in. Five workers and manager Kanitsorn Lengnuey were taken into custody. At Small Room, on Soi Bongkot, Manager Wora­pan Supachokpaiboon, 40, was arrested. The venues were charged with illegally selling alcohol, operating after legal closing times and causing a disturbance with loud music.